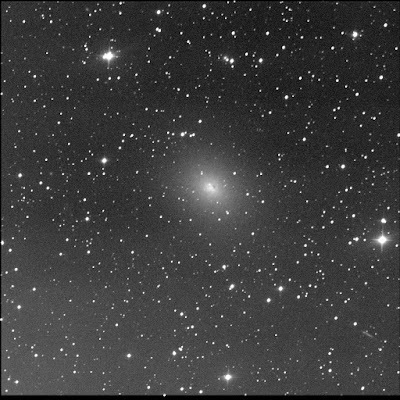 The BGO robot imaged NGC 185 for me (aka Caldwell 18). A galaxy in Cassiopeia. One of the RASC Finest NGCs. Are there some big dust clouds near the core? I really stretched it to pull out the galaxy's dimensions. This image is showing some gradient at the bottom and focus issues at the top... Still, it's neat. Luminance only, 60 seconds subexposures, 10 stacked shots. FITS Liberator, Paint.NET. North is up; left is east. There's a long needle-thin galaxy at the bottom-right or south-west. That's MCG 8-2-8. Due east, near the edge of the frame, above the two equally bright stars is a round fuzzy ball. That's LEDA 2315395. Just below the very bright stars (including SAO 36556) to the north-east is a round lint ball. Not identified in SkyTools 3 Professional. Aladin with NED says this is 2MASX J00393691+4826140. Above and slight left of SAO 36556, right at the edge of the image, is a small slightly oval fuzzy. That's LEDA 2319065. Opposite SAO 36556 is a very small round fuzzy ball. ST3P tagged that as LEDA 2317235. Due north, right beside the bright group of stars, is a bright oval. That's LEDA 2318158. Reshot the target on 8 Aug '16. Reshot on 18 Oct '17.